With Sir Jackie Stewart asking more pertinent questions regarding the FIA's actions this season and calling for Max Mosley's resignation, Max has responded with more evidence of his inability to understand how damaging his direction of the governing body has been to the sport. He seems to think that his answers defeat Jackie's criticisms but, on examination, they turn out to be just half-truths and more slurs on McLaren. Consider this delightful statement from Mosley: "It is not the role of the FIA to court popularity by supporting one party or the other. It is the role of the FIA to ensure that the rules of the sport are respected and that fairness is applied consistently for all competitors." Actually, that is exactly what Sir Jackie is saying - that the FIA is not even-handed in its dealings with the teams. And it is not just Stewart who thinks so; Mosley's fellow FIA supremo, Bernie Ecclestone, told Sport Bild magazine in September last year (long before there was any hint of McLaren's troubles in 2007) "that Ferrari is the only team 'that gets political support' from the FIA." If even Bernie admits that the FIA is not equally fair to all teams, it is time that Mosley proved otherwise, rather than just repeating his assertion like a mantra. Sir Jackie has raised a valid point in suggesting that the FIA would not dream of putting observers into the Ferrari garage to ensure equal treatment beween its drivers. Mosley seeks to hide behind the Spanish Motor Sport Authority on this one, asking whether the FIA should have ignored their request that they oversee the McLaren garage at the Brazilian GP. The answer is, of course, that yes, they should have responded by saying that the FIA already inspects all teams at a GP to ensure fairness and there was no reason to suspect that anything would be different on this occasion. Instead, he prefers to insult McLaren with the suggestion that their assurance of equal treatment for their drivers cannot be trusted. And then back we go to the allegation that McLaren had access to Ferrari information in the early part of the season. It seems that Mosley will never admit that the only thing proved at the WMSC meeting was that de la Rosa and Alonso talked about using information from Coughlan. It is merely Max's opinion that the information must have penetrated further into the organization, not fact, and he has no right to use this to cast doubt on the integrity of other McLaren employees. The final insult is his assertion that McLaren did not appeal against the WMSC's verdict because they knew it was correct. This is patent nonsense. McLaren did not appeal because they knew that no FIA court would ever find contrary to Max Mosley's opinion and to take the case to the civil courts would merely result in the sport enduring even more bad publicity. It seems that McLaren and Ron Dennis have more concern for the image of F1 than does Mosley and the FIA. Does Mosley not realize that it is illogical to counter arguments against the competence of the WMSC ruling by using the ruling as your evidence? That's what we find unsound, Max, the ruling you keep waving at us as justification for all your actions. That is what has brought the sport into disrepute this season, this ruling based upon opinion and your ill-considered comments thereafter, not anything done by McLaren or said by Jackie Stewart. 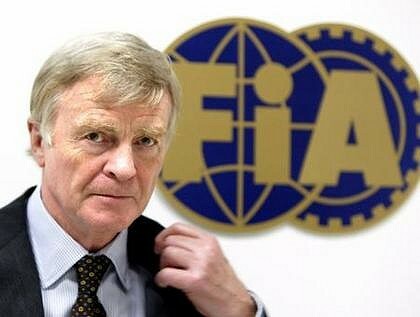 The more Mosley opens his mouth, the more apparent it becomes that he has become unfit to run the FIA. To insinuate that the motive for Sir Jackie's comments is increased sales for his book is yet more insult to counter criticism and we expect better from a president of an international sport. There have been valid criticisms of your WMSC's judgement and sentence in the McLaren case, Max; face it and answer them if you can. A nice reading of the man Clive, but I'm not holding my breath for any change on his part. We've got three more years of this madman and then the new president has to do something about reversing the harm MadMax has wrought upon us. It still amazes me, for someone who has spent so much of his life around F1 that MadMax is really 'out of touch'. Tic Toc, one day, a month, a year .................. who shall replace him? The simple fact is ad hominien arguments (such as Max's attack on Jackie Stewart) and circular "reasoning" (such as using a WMSC judgement to validate the same judgement) can never substitute for logical observation (such as Jackie Stewart's queries about the lack of even-handedness apparent in decisions of the last two months). Of course, power-seeking (the real motive behind Max's poor logic of recent times) is worse than all of the above. I think most F1 fans are agreed that Max is becoming more divorced from reality every day. I sometimes wonder whether his problem is actually physical - creeping dementia or the like - but I suppose Alianora is right that it's power that is doing the corrupting. "power", "coruption", ....... sounds like a politician to me. My view on MadMax is he's a laywer trying to do an engineer's job and has been proven good at neither. Mosley's shameful comments dismissing Stewart's questions belie a man who thinks he is untouchable. Either that, or he is wholly incompetent. The latest move to impose a scrutineer on the McLaren team is, frankly, madness. Scrutineers measure physical attributes. Favouritism is subjective and therefore not measurable in terms a scrutineer would recognise - hence a waste of everyone's time...or perhaps that is the very point. For this to be even remotely fair, there would need to be a scrutineer in every garage - will there be? No. How could Mosley be deposed? Would a petition from the constructors been enough to get the ball rolling? I think these latest idiotic actions may be enough for the necessary forces to be mobilised. For Jackie Stewart to speak out, you can be sure there are many in the sport, in positions of authority, who agree. Let us hope they act. Strictly speaking, Mosley cannot be deposed until the next election for FIA president, which doesn't happen for another three years or so. But I figure the manufacturers are not going to like what is happening at the moment (after all, if it can happen to Mercedes in the form of McLaren, it can happen to any of them) and they will surely get together and force change on the FIA, using the threat of withdrawal or a rival series as a lever. In the past the constructors have tried to fight the FIA and lost - but the teams represent huge companies now and cannot be brushed aside as the small teams of thirty years ago were. There is hope for F1 yet! Sorry for this late reply. I never read the comments last time i read this one. But as a comment on the last few words between Alianora and Clive. LET'S START THAT REVOLUTION NOW!!! F1 needs to be reinvented if we wait until Mad Max is done in about three years. Revolution is what's needed, not only to get rid of Max but also to restructure the FIA. It needs to be run in a far more open and democratic fashion if it is to function properly in today's world. Mad max, is destroying F1 he so bias against McLaren. I really believe he mad it’s time for this man to go every time he open his mouth he turns my stomach. It’s time Mad Max got lost. I have no respect for him or his stupid opinions. I think max is actually Robert Mugabe (not sure if he whites up or blacks up though). There's the same mad power lust, same distortion of reality, same desperation to blacken names of dissenters and even do away enemies (metaphorically of course) they both have the same love of luxury and they're both clearly insane.. and as a clincher, has anyone ever seen the two of them together? Mugabe dare not leave his own country because he knows that he would be deposed instantly (and probably have to face an international court for his crimes against humanity). To the best of my knowledge, Max has never visited Zimbabwe. So I doubt your basic premise, Al, although the comparison is interesting. There are differences in scale, it's true, but essentially the dictatorial style is the same. There seems to be general agreement that Max Mosely has now blotted his copybook too many times, and that clearly his personal moral standards leave much to be desired. He has treated his wife with little more than contempt, and does not seem to have grasped the fact that motor racing fans as well as the industry itself now takes a very dim view of Max. There has been a feeling for a long time among race fans that Mosely has been Ecclestone's poodle. It's time for the FIA to finally shoot the dog and try to restore some lustre to the motor sports represented by the FIA. Agreed, Geoff. Surely this time Max has gone too far and is about to meet his comeuppance.